A report about the mystery " Bubble Cloud " over Beijing Skies . Not sure if this is a followup report as we may have touched on this in August. The below news report explains the bizzare sighting in further detail. The real question that remains is what could have caused this? .. any ideas? If anyone from China knows more about this sighting we would like to hear from you. Im not sure how humans could have created this as this scientists suggest ? "At first, it's relatively small and bright, the upper part is something like a semi-circle, a spherical ring of light, it's obviously becoming bigger and bigger then." When the observation team set their instruments at the bubble, it gradually became bigger and thinner. The entire occurrence lasted for less than 15 minutes. Observers took pictures of the whole process and posted them online. Staff members at the Beijing Planetarium believe it was the same phenomenon after an analysis of time and space. "Of course people had a lot of discussions, personally I think it's a kind of meteor or a phenomenon in terrestrial space." Experts say the bubble cloud was unlikely a natural phenomenon. 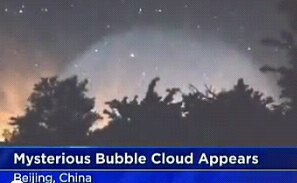 Judging from the pictures, the bubble cloud was hundreds of miles away from observers in Beijing.